What is hypertonic saline (HTS)? HTS is sterile water into which common salt (sodium chloride, NaCl) has been dissolved. The degree of salinity, or salt concentration must be greater than 0.9% in order to be consider “hypertonic.” Relative to the body’s normal physiologic salt concentration, 0.9% saline is considered “isotonic,” anything below 0.9% is considered “hypotonic,” and anything above 0.9% is considered “hypertonic.” The typical range of HTS for inhalation extends up to 7% although 10% is occasionally used for diagnostic sputum induction procedures for special cytology or microbiology tests. How was HTS discovered and developed for patients with CF? I have been in respiratory care since 1965, and I personally recall seeing HTS being used as early as 1967 in CF patients. One of my recollections was that it was commonly given, along with propylene glycol, in a mist tent and patients would have to spend hours, or even sleep overnight, in the mist tent. However, over the years, the utility of mist tents was called into question for a variety of reasons, and they have fallen out of favor. Instead, aerosol therapy by nebulizer, applied to the airways through a direct mouthpiece or mask interface has become the standard delivery technique. Somewhere along the way, use of hypertonic saline also fell out of favor but tended to wax and wane until approximately 20 years ago when renewed interest in it emerged. Was it discovered in Australia? No, not exactly. Hypertonic saline has been in use in CF, on and off, for at least 50 years. However, inasmuch as we all love a good urban legend, especially one with a happy ending, about 10 years the press widely embraced and circulated a “feel good” story about Australian CF patients who were surfers having better lung function than non-surfers. This prompted a very large study of HTS by Australian investigators that was published in New England Journal of Medicine in 2006 and has supported the use of HTS and, to some extent, may have caused a resurgence in its usage. (Elkins MR, Robinson M, Rose BR, et al. A controlled trial of long-term inhaled hypertonic saline in patients with cystic fibrosis. N Engl J Med 2006; 354: 229-240). Why is it helpful for patients with CF? The short answer is that osmosis, promoted by the large gradient in salt concentration, draws water into the mucus from the underlying airway tissue. A more detailed explanation is quoted here: “In the healthy airway, the mucus layer and the perciliary layer (PCL) of the airway surface liquid (ASL) are normal thickness and consistency. Electrolyte (Na+ and Cl-) exchange is normal allowing equilibrium of water in order to maintain proper viscosity of airway secretions. “In the CF airway, due to the fundamental defect in Cl- transfer, water is maintained in the epithelium and does not adequately hydrate the ASL. As a result, the mucus layer enlarges and becomes more viscous while the PCL shrinks due to loss of water. The cilia do not function adequately and mucociliary clearance diminishes leading to inspissated and infected secretions and a viscous cycle. (Reeves EP, et al. Hypertonic saline in treatment of pulmonary disease in cystic fibrosis. The Scientific World Journal. 2012; 2012:465230). Is there a correct pH balance? Until recently, the pH of HTS was not regarded as important or something that should be deliberately altered. However, it has become recognized that HTS is inherently acidic, with some HTS solutions as low as pH 4.0, and that buffering with a base such as sodium bicarbonate, thereby raising the pH to physiologic levels (pH ~7.40) can reduce the “sting” and airway irritation that accompany HTS inhalation, especially at a higher concentration of 7% NaCl. In addition, a recent study by Dr. Jane Burns, et al, at Seattle Children’s Hospital determined in vitro (in a petri dish in this case), that the “kill rate” of Pseudomonas organisms in sputum cultures exposed to pH-buffered hypertonic saline was higher than the rate for non-buffered 7% hypertonic saline. Although this was not a clinical study, it is suggested than pH-buffered 7% hypertonic saline may be beneficial in CF and bronchiectasis patients when combined with their airway clearance and aerosol protocols. Hopefully, when this is finally vetted by a clinical study this will provide an even more compelling reason to use pH-buffered HTS. (Burns JL, Griffith A. pH-dependent differential Pseudomonas aeruginosa killing in CF sputum incubated with hypertonic saline solutions. Peds Pulmonol 2014; 49;S38: 351). Is it only helpful at 7% sodium chloride? Can I use 3% if I experience airway irritation? Both concentrations may be helpful, but the 7% concentration presumably exerts a greater osmotic effect and would therefore theoretically be more useful. However, if the higher concentration causes irritation, and a patient defers using it for that reason, it has lost its usefulness. Arguably, use of 3% HTS, where 7% is not tolerated, may be better than no use at all. Perhaps pH-buffered HTS should be used whenever irritation and lack of tolerability occurs, or even prophylactically to prevent irritation altogether. At what age can patients begin taking it? I don’t know if there is a definitive answer to this question and think this is best determined on a patient-by-patient basis. 3% HTS is commonly given to children, age 6 months and greater, who have bronchiolitis due to seasonal RSV (respiratory syncytial virus) infection. In the Australian study cited above, CF patients had to have reached at least 6 years of age to participate in the study, although this may have been related to the issue of cooperation and adherence to the treatment protocol more so than any safety issue. How much should be nebulized and how often? Unit dose hypertonic saline typically is packaged in 4 mL plastic unit dose vials. The typical prescription is for 4 mL (1 vial) twice daily. Is there a preferred nebulizer? Compressor setting? Any of the nebulizers and compressors that can effectively deliver Tobi® or Pulmozyme® should likewise be able to effectively deliver HTS. As with all nebulizer/compressor combinations, the greater the output pressure and flowrate, the greater the output aerosol and the less time the treatment will require. When should HTS be nebulized relative to other inhaled meds? Will it interact with other meds in the nebulizer cup? The CFF recommends that for patients taking a multitude of inhalation medications, a bronchodilator (typically, albuterol sulfate) be inhaled first. The beta2-agonist effect of the albuterol will relieve bronchospasm if it is already present, and may mitigate its occurrence if stimulated by patient coughing or potentially irritating inhalation agents such as hypertonic saline, dornase alpha and tobramycin. Either hypertonic saline or Pulmozyme may be given second, or second and third. Inasmuch as they both have mucoactive properties, their order following the bronchodilator does not matter. As for “interacting” with other medications, there is no adverse drug-drug interactions or “miscibility” issues for HTS, per se. However, that does not mean that it is advisable to mix HTS with other medications. What many people do not realize is that when two or more drugs are mixed together in a nebulizer, the total solution volume increases, and both drugs effectively dilute the concentration of each other. While that is not necessarily bad in and of itself, what may happen is that, unless the patient makes sure to run the nebulizer completely to sputter, no matter how long it takes, they may receive a smaller inhaled dose of each drug than they would if they were given separately. How is HTS different from Pulmozyme? Chemically, HTS is simply water into which salt (sodium chloride, NaCl) has been dissolved. Pulmozyme,® (dornase alpha) is much more complex. It is a highly purified solution of recombinant human deoxyribonuclease (rhDNAase), which is a peptide or enzyme that “digests” the DNA (deoxyribonucleic acid) that is present in the CF sputum. Thus, their mechanisms of action are different. Although they may both be considered mucoactive agents, they work differently and may be complimentary by breaking down purulent sputum by different means. The use of one does not preclude the use of the other. Can I buy HTS over the counter? Can I make my own HTS? I do not know of any OTC hypertonic saline that is available for inhalation purposes. I’m not saying that it does not exist. But if one were to find an OTC hypertonic saline solution, it may or may not be at the correct concentration. Further, it may or may not have other chemicals in it, such as preservatives (benzalkonium chloride, etc) that may be contraindicated due to their propensity to trigger bronchospasm when inhaled. And most importantly, it may or may not be sterile. Further, if is available in a large volume container, such as 500 or 1,000 mL, even if it was sterile, sterility could not be guaranteed after it is opened and used for the first time. So for this reason, I would instead recommend unit dose vials of hypertonic saline specifically made for inhalation. 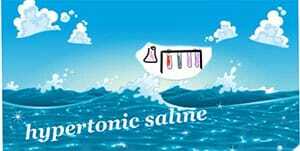 As for making one’s own hypertonic saline, it is technically possible. One would require the ability to obtain high quality NaCl without any additives and use pure water without any additives. That would rule out tap water in most parts of the country. One would also require the ability to measure water volume and weight of the salt accurately, preferably by the metric system. A clean workspace and utensils would be needed as would the ability to sterilize the water by boiling prior to adding and dissolving the salt in it. However, once made, the issues of keeping it sterile, storing it in sterile vessels and accessing it using sterile technique would be challenging. I do not have information about the extent of insurance coverage. Written by: Imogene on February 4, 2016. Whete can find the answer to this questions?